Wait.....you're telling me, you spent money on rocks? You buy rocks? To put on a shelf? Yeah, I'm an idiot. I know. But, I enjoy it, so I'm indulging myself again today. I did say a few posts back I was going to do more fossil posts. And, I still plan on it. However, I'm unable to photograph the fossils I want to showcase, so they will be delayed. I am going to show off the latest and greatest rock I bought. This picture is not mine. It is of the actual fossils I bought, but I had to use the ebay sellers picture because I just bought it today. It won't get here for a week or so. Anyway, what you're seeing in that picture is a different kind of fossil. The scientific term for fossils like that is, Ichnofossils. In plain english, they are called trace fossils. Trace fossils are fossils that were made by a living creature, but don't include the actual remains of whatever made them. The most common ichnofossils would be foot prints. Everything from birds, to dinosaurs, to reptiles, mammals and even trilobites leave footy prints. There have even beed fossils of rain drops and the lapping of waves found. Obviously, ichnofossils are scarce. All fossils are. But the trace ones are scarcer. And, not all trace fossils are footprints. Sometimes they are ones like what is pictured above. They are called Rusophycus. And what they are is, resting beds of trilobites. You may remember from earlier posts that trilobites were very common in the early seas. And while some swam, most walked on the sea floor. You can purchase trilobite trackways. They are actually pretty neat, and are on my list to acquire. But, as they hunted, trilobites would not eat their meal out in the open. There were creatures like Anomalocaris loved to eat them. So, they would burrow into the silt/sand/muck of the sea floor to eat. And also to rest/sleep. The most sought after rusophycus are the ones that have the tracks leading up to and away from them. Those are generally museum pieces, though. By looking at the shape of these rusophycus, we can tell they were made by a Flexicalymene. 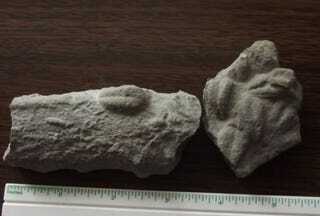 The single one shows incredible detail for a fossil of this type, and the second shows multiple resting places. These are a great addition to my collection, and are nice examples of something you wouldn't normally consider as a subject for fossilization. I am looking forward to showing off some of my other fossils. They are, (in my opinion), quite impressive, and show just how weird life used to be. Until then, enjoy this one, and if this wasn't the kind of oddities post you have come to expect, tough. It's my post and I'll post what I want.